In attendance were Berry Zimmerman, Bruce Follansbee, John Bodin, Eric Veal and new attendee Morgain. Morgain sold re-breathers for SCUBA applications for about $8,000 apiece. Brene Brown: "The story I am making up is..."
At our next meeting: We discuss GRATITUDE and Its Utility in the Spirit of Thanksgiving. Thank You vs. You're Welcome. Is a two-party system good enough? "Mechanisms of Influence" - Scott P.
Political Media Complex - Scott P.
How would we know public sentiment (signals, polls, etc.) early? What is the impact of the votes I've made? How would I know the impact I made? Getting Involved - What, So What, Now What? When public opinion corresponds with the voting - Scott P.
Amazon Seller Central has an app store now. This is a good place to look for tools and whatnot for selling on Amazon. Feedback Whiz is a handy tool for boost business, repairing feedback, improving product reviews, and automating high-volume emails. Viral Launch is another tool for selling on Amazon. It provides stats of how much people in categories are selling and helps with research. Zon pages is another tool for boosting Amazon sales. Instagram good. One guy at the group recommended focusing on building up cred on Instagram in particular. Basics of the listing. Multiple attendees agreed that great pictures are very important for the listing, as are the title and bullet points. Reviews are important but sales are more important. Attendees said that reviews help stickiness of the listing but sales are the main driver for searchability. What if we were to try to sell these products for a deep discount (and state how big the discount is) so we can get sales up? Pass the plate to talk. "Plate Spotting"
Need a leader or president. That's where reality is. People spend 90+% of their time in unreality. "Democracy is something that happens every 4 years otherwise we live in authoritarian structures." Steve K.
Some people are truly about helping the world - Larry. Marx's kids died he was so obsessed with his goals. Musk and Bezos in this category. The power of the individual. Some (most) will be sheep that follow. Hyperloops from Seattle to San Diego in an hour are sexier than Harley Davidsons. Nick Hanauer link - Mike Pritchard - Maybe he could lead the charge on it. The media needs to carry the story. Global Climate Change and Grief course at UW Bothell via Mark. He knows the professor. Schoolkids doing gun control - are they going to succeed? Media Company - newspapers and media. Reporting. Hanson on Climate Change. Corporations took over. Inconvenient Truth. Gore now working with China and working on coal. Larry takes his tech to China. Mindset and cultural fit are two of the most important issues facing many of us today. What's mindset? How an individual thinks and what they believe (their values). What's cultural fit? The degree to which the individual and their mindset fit within the culture of the organization. These two things, in conjunction with each other, are a key lens through which we can look at a variety of situations and scenarios. Take my position at Siemens Corporation in the early 2000's. My mindset was creative, ambitious and entrepreneurial in the beginning and by the end my mindset was more contrite and global. During my six-year period there, I grew and learned much more about global business initiatives and challenges of integrating, say German with Silicon Valley cultures. The culture at Siemens was global, German, quality- and process-minded. I, too, became very process-minded and I think was a good fit for the culture. I was a good boy and became very good at getting things done globally by managing up to higher and higher parts of the organization. After Siemens, I had a confident mindset and went to Nordstrom, a local company that looked great at the outside. I came to find out that their culture was cautious and somewhat bureacratic. They were flexible and worked as a team and this was a shock for me. I wasn't there long. Wrong mindset by me, I think, and the cultural fit looked good but ultimately was not. I looked fat in those jeans. At Tableau, my mindset is contrite and humble. I am appreciative to have my job and like my coworkers. I work with cool global accounts and am proud of my blessings. Tableau's culture is very clear and positive although it's not perfect. It needs work and is going through change. It is becoming a more global company and needing to flex to play at the enterprise level, where I spend every day. There's still a fit between me and Tableau because my mindset is flexible and its seem to be as well. What's your mindset? What are the cultures of which you're a part and what are they like? How's the fit? What can you do about it? What can be done about it? The AppsJack group of local change agents gathered on May 22, 2018 and met with Larry Gales, technologist and former UW faculty member about energy efficiency. Larry is passionate about the environment and shared with the group an "existence proof" he has created about a future where we have reduced our energy usage by a factor of 30x. The problem? Getting there. Here's how Larry paints the future: he breaks it into two areas and this message is for the general consumer. Area 1 is personal transportation and he has concrete proposals. Area 2 is residential where he also has specific proposals and integration factors between the home and travel. If we think about it, we realize that our biggest personal energy foot prints are indeed in these two areas. First, transportation. Larry proposes that families have three vehicles 1) a 1-person small vehicle 2) a 2-person small vehicle and 3) a larger EV such as a Tesla Model 3. Electric bicycles are also a small aspect of Larry's vision. Second, homes. Mr. Gales' recommendation for significantly reducing home energy consumption is through the European Passive House model. These homes are airtight and use fans and heat exchangers for efficiency. Although their overall cost to produce is about 5-7% higher than a traditional home, the costs are typically recovered. Larry's ideas also are predicated on much smaller homes of about 1,000 sqft. Larry also imagines an interface between the cars and the home in that the big car's battery charges and runs the home, largely. David Slight shared a new acronym that I had never heard: PESTLE. Pestle stands for Political, Economic, Social, Technical, Legal, Environmental. These are critical perspectives and views necessary to apply when considering a proposal or plan. David's statement is there must be sufficient science and due diligence as well as leaders to lead social change. The group shared cynicism of the USA's ability to transition into such a vision of the future. Susan Stringer shared positive news that there is a group of scientists running for office. The group agreed that there is such a vast disconnect between interests and perspectives that a model, resources and great leadership are needed to bridge that gap. Someone recommended this book about corruption in the American political system. Someone else recommended this episode of Real Time with Bill Maher that showcases Bill Nye. The Gates Foundation has a program that focuses on changes within the USA, which is really nice to see. Some cities are painting streets white in an attempt to combat climate change. Sad! 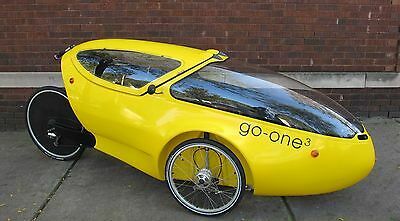 The two tiny vehicles don't really exist yet, but the closest vehicles are called "velomobiles" which may be human or electric powered. You can see images here. Please join us on Tuesday, June 26th for our next gathering to change the world through meaningful dialog and strategic action.